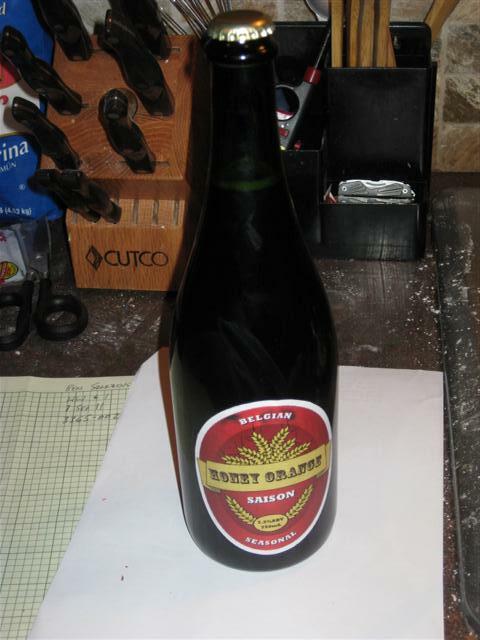 I am giving away my saison as a gift this year and decided to dressy the bottles up a bit more than I have in the past. 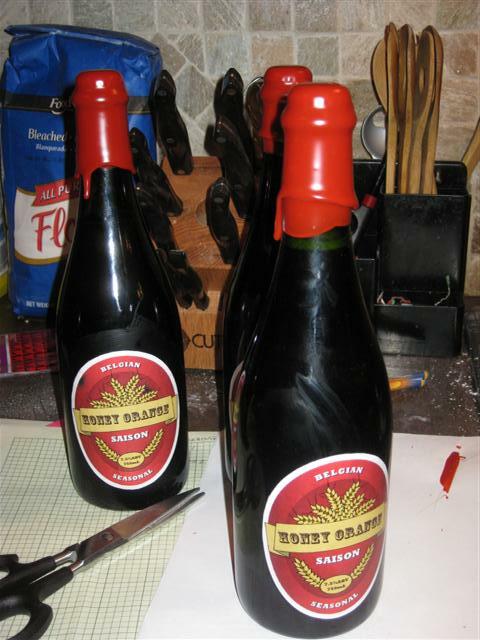 I figured labeling and waxing the caps would give the beer a nice presentation and may persuade people that I am awesome. To begin, I took out a sauce pot and filled it about 2/3 of the way full of oil. 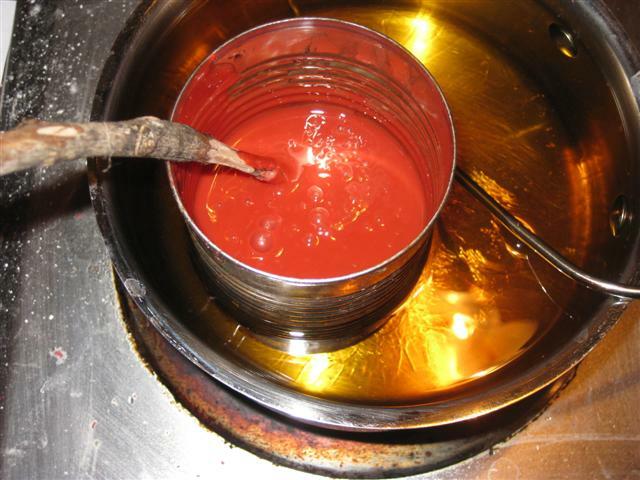 The oil will expand when heated so don't fill it all the way up. Then I added 8 10" glue sticks, and 20 red"ish" colors crayons to a disposable can placed in the center of the oil. I roughly chopped them up to speed the melting process. It took about 10 min to melt after I had gotten the oil bath up to 375F. I tried to keep the oil at that temp during the entire dipping process. After dipping the bottles, I spun it a few time to remove the excess wax and allowed it to drip slightly. This is the first time I have tried wax dipping or labeling and I am pretty impressed at how nice it makes a plain old bottle of beer look. Those are champagne bottles if anyone is interested. Did that mix of glue sticks to crayons seem to be a good combination? It looks like it came out very nice. Yea. It wasn't nearly as sticky or thick as I thought all that glue would be. The key is to keep adding crayons and heat until you get the consistancy you want. I never measured the wax temp, but the hotter it gets the more it runs. I did a few trial bottles to figure it out. What kind of oil? Deep flyer oil or some other type of cooking oil? I just used deep fryer oil because I have 5 gal of it in my garage. It's not really important what you use. I just wanted to use something that could get hotter than boiling water. I'm certain that would not be hot enough. I've heard of people heating it directly over the stove burner but I have an electric stove. if i ever have something around long enough to fancy it up, i'm doin this. This looks pretty cool. Is it cheaper than the wax beads from the home brew shop? Compared to my homebrew shops price, it's way cheaper... When I did mine, I got the glue sticks from michaels on sale for 2 dollars for a massive bag of them, the crayons were some off brand I scored at Walgreens for 1 dollar, I bought two boxes. So a total of less than three dollars if you only account for the glue sticks I used, plenty of wax to do a grip of bottles and I saved my can for later reuse. Interesting. Do you color the paraffin with anything? I heard of a brewery using the crayons from the brew pub side. Restaurants usually just throw those out. 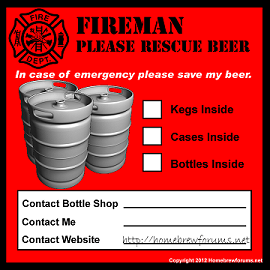 It would be a good source and help repurpose some typical waste. I have not colored it... It's usually whitish without any coloring added... I suppose you could melt some crayons in there with it maybe? That's what I was thinking. Or food colouring? I don't know how well that would mix. 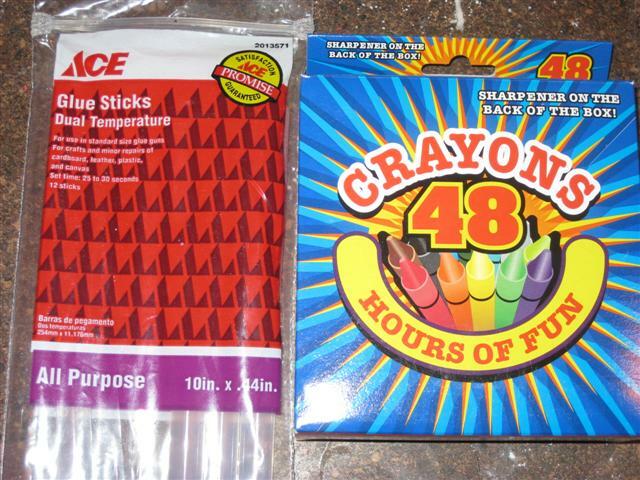 most people use crayons and a bit of hot melt glue gun glue. Right, but is that cheaper than 10 pounds of paraffin wax for 10 bucks? Prolly not. i'd probably cut the glue with paraffin, but still use some glue to give it a bit of tackiness and compliance. straight paraffin won't adhere to the bottle and it's pretty brittle so i think it would have a tendency to crack and chip easily. as for the colorant, crayons work well and they are pretty cheap. but you can steal the crayons from your kids! that's sorta free.